The Book of Waves: Diango Hernandez at Marlborough Contemporary by Francesco Dama – Diango H.
The Book of Waves: Diango Hernandez at Marlborough Contemporary by Francesco Dama Through such gentle acts of visual subversion, Hernández suggests that there is no greater teacher than nature. What is the lesson to learn, however, is what each of us is called to find out. Trough the years, Düsseldorf-based artist Diango Hernández has developed an articulated practice that, in spite of its different formal outcomes, has been coherent in exploring his cultural heritage. The artist grew up under Fidel Castro’s utopian Revolution. As a child he experienced the harsh communist education system, aimed to shape the revolutionary “New Man”; as a youngster he witnessed the dissolution of the Soviet Union and the consequent collective disillusionment in his home country. 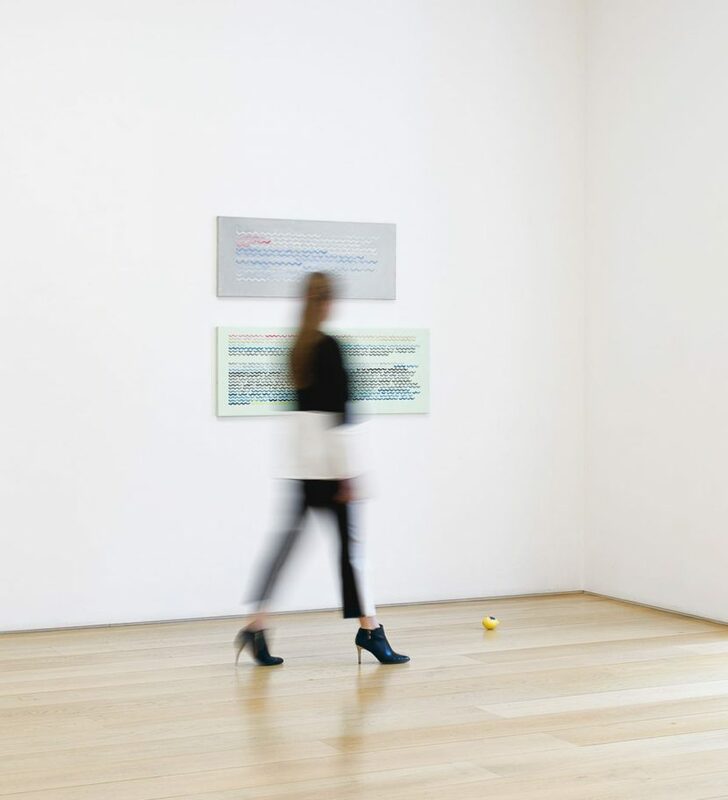 ‘The Book of Waves’, Hernández’s exhibition at Marlborough Contemporary, sets forth a new period in the artist’s carrier, ripening a visual language presented in his previous solo shows at Kunstverein Nürnberg and Landesgalerie Linz. The latter, emblematically entitled ‘Socialist Nature’, enabled Hernández to play with the seemingly peculiar relationship between communist ideology and nature, introducing in the gallery works featuring tropical fruits. ‘The Book of Waves’ develops and completes some of the themes in the Linz exhibition, presenting a new body of works. Following a metaphorical process that is often involved into his practice, Hernández has extracted some quotations from Fidel Castro’s 1961 speech, ‘Words to Intellectuals’ and has translated them into a pictorial language. The translation has been made using a font designed by the artist in which all the characters look like the same diagrammatic wave, so that once the text is changed into this wave font, the final rendering looks like a repetition of schematic sea waves painted on canvas. These works consciously make use of an analogical process, transforming the original information held by Castro’s text into Hernández’s own graphic language. In this way, the similarity between the two objects – the source material and the final work – it’s not immediately visible, even if preserved. Hernández doesn’t destroy the text, he interprets it: the authoritative, self-celebrative tone of Castro’s speech is silenced by the melancholic sound of the sea, reminiscent of nature and of intimate moments of contemplation. In these canvases, promptly renamed ‘waves paintings’, Hernández allows himself to make use of a bright, playful tone and of a pastel palette that stand in contrast to the coercive accent of Castro’s thought. The waves channel a dense nucleus of themes into a poetical form, even referencing the tradition of painting, with allusions to marine art. To enhance the suggestion of landscape, three long waves painting are hung in line on the longest wall of the gallery, evoking the horizon line. Following a strategy close to the canvases’, Hernández has then painted the skins of some lemons with international maritime signal flags. Similarly to the wave font, the abstract combinations of colours painted on the fruits are part of a visual code whose meaning is not immediately readable. 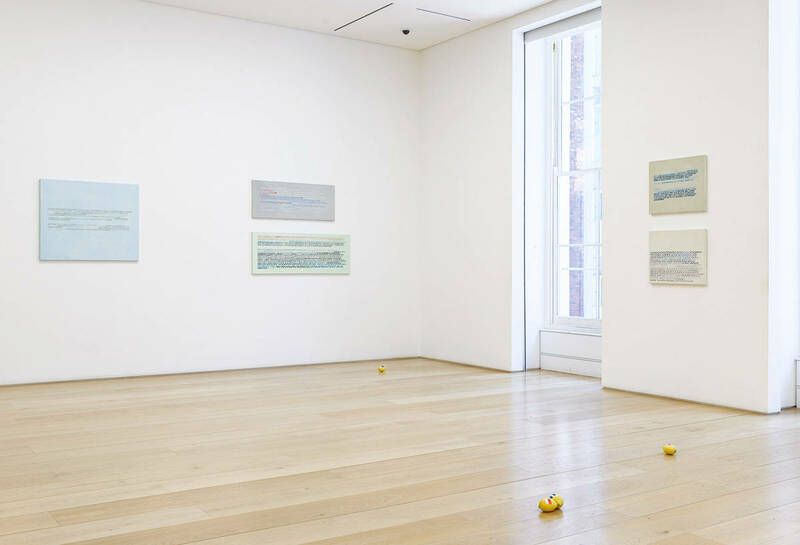 Scattered on the ground, these Floating Lemons (2015) engage the viewer with Hernández’s personal relation with space, turning the floor of the gallery into the ocean’s surface. Fruit constitutes a powerful embodiment of meaning for the artist. It stands as an image of tropical pleasure and sweetness, but it is also the object of exploitation committed by the American Fruit Company in his home country and therefore a symbol of colonialism. More recently, fruit has come to represent the concept of nature as a fundamental source of freedom, a notion absent in revolutionary Cuba and filtered through Hernández’s experience of European culture. In this sense, the idea of contemplating nature is traceable in Sunsets (2015), a collection of charcoal drawings depicting setting suns at various stages of visibility, drawn onto each separated page of ‘Guerilla Warfare’ (1961), by Ernesto ‘Che’ Guevara. Cleverly spread-out on the gallery wall to recreate a book layout, the simple suns drawn on these book pages change the lines of the text into waves, transforming the reading experience of the original guerrilla guidebook into a romantic moment of meditation. Through such gentle acts of visual subversion, Hernández suggests that there is no greater teacher than nature. What is the lesson to learn, however, is what each of us is called to find out.